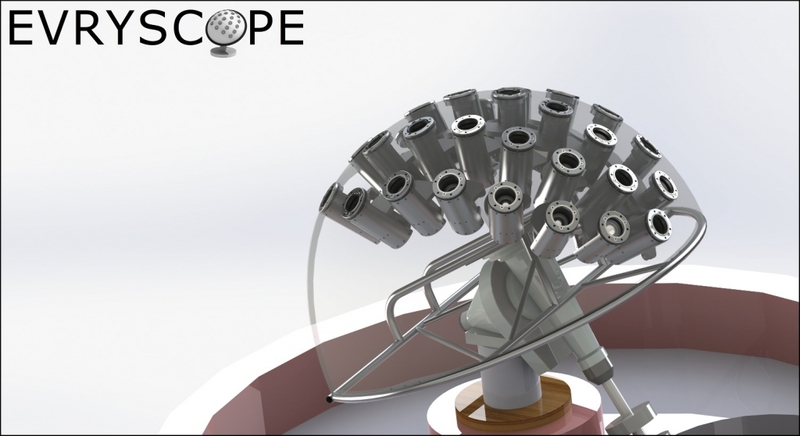 The Evryscope concept mounts an array of individual telescopes into a single hemispherical enclosure (the “mushroom”). The array of cameras defines an overlapping grid in the sky that can provide continuous coverage of >8,000 square degrees. The camera array is mounted onto an equatorial mount which rotates the mushroom to track the sky with every camera simultaneously for 2-3 hours, before “ratcheting” back and starting tracking again on the next sky area. Our prototype Evryscope design consists of a single mushroom which contains twenty-four 61mm telescopes, each with a rectangular 28.8MPix interline CCD imaging a 394 sq. deg. FOV using an 85mm f/1.4 lens. The dome tracks the sky on a standard German Equatorial mount, with the entire system imaging an instantaneous 8,000 sq. deg. FOV (after camera overlap is taken into account). The individual telescopes are fixed into holes in an aluminium-reinforced fibreglass dome. A 5-position filter wheel on each camera allows a selection of filters as well as providing a blocking shutter for dark exposures and daytime light protection for the cameras.